Two teams involved in tough division races in the United States Football League’s inaugural season met in Week 10 on May 8, 1983. The visiting Tampa Bay Bandits were 6-3 and even with the Chicago Blitz in the Central Division while the hosts, the Oakland Invaders, had the same 4-5 record as the other three clubs in the Pacific Division. Tampa Bay had gotten off to a 4-0 start under the guidance of offensive-minded Head Coach Steve Spurrier. The passing game was the key to success, and while 33-year-old veteran QB John Reaves went down with a broken wrist three weeks earlier, Jimmy Jordan (pictured above), a former Florida State standout, had taken over the starting quarterback duties and performed capably. The Invaders also had a capable quarterback in Fred Besana, a former minor leaguer, and experienced stars on offense in TE Raymond Chester and RB Arthur Whittington, who were ex-NFL Raiders. Coached by John Ralston, Oakland had problems with consistency and had won for the first time in three weeks in the previous game, but in the league’s weakest division, it was enough to keep pace. About 10,000 of the 26,989 ticketholders were no-shows at the Oakland-Alameda Coliseum for the nationally telecast Mother’s Day game. Many of those present spent much of the contest loudly booing the home team. On their first series, the Bandits reached the Oakland 46, but they came up empty when a completion to WR Martin Cox was fumbled by the receiver and CB Kenny Daniel recovered at the Oakland 19. On Tampa Bay’s next possession, Jimmy Jordan completed a 19-yard pass to WR Danny Buggs that moved the ball to the Oakland 11 and, while a penalty nullified a potential touchdown play, Zenon Andrusyshyn kicked a field goal from 22 yards to give the visitors a 3-0 lead with 2:09 remaining in the opening period. The Invaders responded with a promising series that included runs of 15 and 22 yards by Arthur Whittington, but WR Gordon Banks coughed up the ball at the Tampa Bay 10 when hit by FS Glen Edwards after catching a pass and SS Doug Beaudoin recovered to extinguish the threat. Jordan was sacked during the ensuing series in which the Bandits were forced to punt, but Tampa Bay got the ball back when LB Kelly Kirchbaum recovered a fumble at the Oakland 46. Once again Jordan was sacked, for a loss of 11 yards, and the visitors punted once more, but a Whittington fumble on the ensuing series gave the Bandits the ball at their own 44. This time they capitalized as RB Greg Boone ran effectively and Jordan completed three passes as Tampa Bay used nine plays to go 56 yards. With 3:35 remaining in the first half, Jordan threw to Buggs for a nine-yard touchdown. Andrusyshyn added the extra point. It seemed as though the Invaders would get on the board before the intermission as Besana threw to WR Wyatt Henderson for a 21-yard gain to the Tampa Bay seven, but a third down pass hit Henderson in the shoulder and was intercepted by CB Jeff George. While Oakland did get one last shot with 27 seconds still on the clock, Kevin Shea’s 55-yard field goal attempt fell short. The Bandits took a 10-0 lead into halftime. Jordan was efficient in the first half, completing 12 of 14 passes for 145 yards. Oakland moved the ball well on offense, compiling 227 yards, but gave up three fumbles and an interception. The Bandits drove 68 yards to open the third quarter, with Jordan throwing to WR Eric Truvillion for an 18-yard TD. Andrusyshyn again converted to put Tampa Bay up by 17 points. However, Jordan was lost with a shoulder separation midway through the period as he threw long for Truvillion and was struck by NT Dupre Marshall on a borderline late hit. Nathaniel “Billy” Koonce came in for Jordan and Tampa Bay was unable to generate any offense for the remainder of the game. Koonce threw only two passes and one was intercepted, setting up Oakland’s only TD. His first toss hit Truvillion but bounced away and was picked off by SS Marcus Quinn of the Invaders at the Tampa Bay 20. Shortly thereafter, and just four seconds into the fourth quarter, Besana ran three yards for a touchdown. Shea’s extra point made it a ten-point contest. The Invaders again drove into Tampa Bay territory, but with just over four minutes to go, an apparent scoring pass from Besana to WR Gordon Banks in the end zone from four yards out was nullified by an offensive pass interference penalty. Oakland was forced to settle for a 30-yard Shea field goal. The Invaders still had comeback hopes, but they were finally dashed in the final seconds when Besana’s desperation pass was intercepted by George, his second of the contest, to seal the 17-10 win for Tampa Bay. The Invaders outgained Tampa Bay (402 yards to 251) and had more first downs (24 to 17). They also recorded four sacks, to three by the Bandits. However, Oakland was undone by six turnovers, losing four of six fumbles in addition to two interceptions. The Invaders were penalized seven times, at a cost of 60 yards, to four flags thrown on Tampa Bay. Before being knocked out of the game, Jimmy Jordan completed 15 of 22 passes for 200 yards and two touchdowns while giving up one interception. Greg Boone led the team with 46 rushing yards on 14 carries. RB Sam Platt contributed 28 yards on 12 attempts and had five catches, for 54 yards, while Danny Buggs accumulated 64 yards on his four pass receptions. For the Invaders, Fred Besana (pictured at right) completed a then-USFL record 15 straight passes during the fourth quarter comeback on the way to compiling 25 completions in 38 attempts for 254 yards, but with two picked off (he would exceed his consecutive completion streak the following year). Arthur Whittington rushed for 128 yards on 26 attempts but also fumbled the ball away twice. HB Louis Jackson had 7 catches for 70 yards to top the club. The win improved Tampa Bay’s record to 7-3, and the Bandits maintained their share of the Central Division lead along with Chicago. 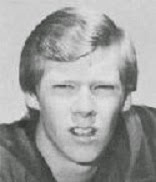 Billy Koonce was quickly supplanted by Mike Kelley at quarterback in place of the injured Reaves and Jordan, who both eventually returned, and talented rookie RB Gary Anderson joined the club. Nevertheless, the team faded down the stretch and finished in third place and out of the running at 11-7. The Invaders ended up with a 9-9 record, but that was enough to top the Pacific Division, although they lost badly to Michigan in the first playoff round.